So, I had a truly special (sort of) moment today. but anyway, we got a late start to orientation because the hospital-wide orientation was still finishing up this morning so I was able to eat lunch before I went in. Well, my favorite kind of lunch is at this one deli in my town. I visit so frequently that the deli guy starts making my sandwich (same thing every time- I'm boring), as soon as he sees my car park. So being that it was a beautiful day out, I decided I wanted to have a special lunch that I could cross off my bucket list-- Eat a deli sandwich in my favorite park. Its only right down the road from the deli and I have always said I'm going to go have a picnic and yet I never actually do it. So being that it was sort of a big emotional/important day, I decided it was a good time to just do it. Well, went I went to pay for my sandwich, I happened to glance down at my dollar that I was giving to him and realized "I love you" was written on it. AW! It's just like a movie! So, I immediately took it back and gave him another dollar. I wanted to keep this special dollar forever and quite possibly frame it because it was just that adorable. I mean, what was the story behind it? Who wrote it to who? Why did they give it away? Was that a friendly reminder of love? Was it a desperate attempt to get someone back? Was it even romance, or possibly family? Either way, it was truly just....one of those adorable moments. 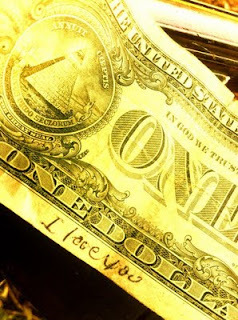 So I continued eating my sandwich, and moved about my day, made so much better by this little dollar and the message. Well, I got to work, and reached for the dollar in my pocket, so I could take it out and put it in a special spot so I wouldnt accidentally use it. Well, no dollar. Turns out the dollar must have slid off the bench possibly when I wasn't looking at the park, and I forgot to look for it on my way out. So, dollar was gone. I was really pissed at myself. 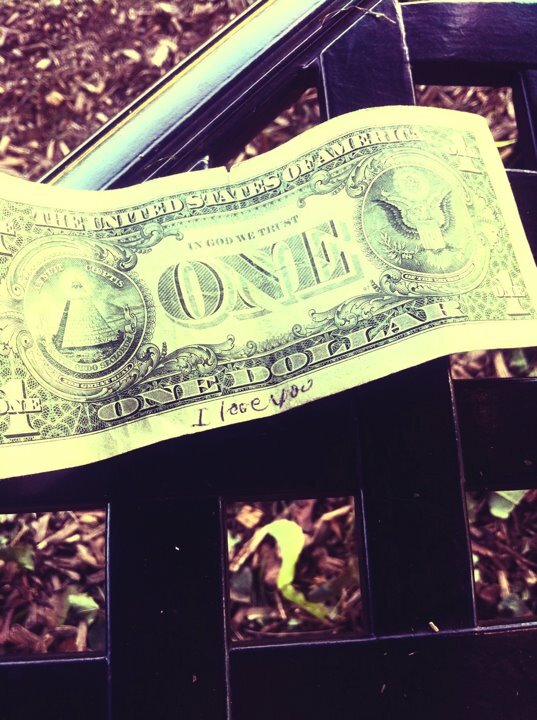 Found such a cute dollar and couldn't even spend more than 10 minutes with it. But then.....I realized something. If I had kept it, no one else would get to see such beauty. And what would I do with it, really? It would go in my keepsake drawer and get looked at every so often, but its not like the dollar was written for me, so it really had no additional meaning to it. So I'm glad I left it in the park. Its not like it was $100, it was $1. And I hope it blew away and landed in someone elses hands, to find it one day and feel like they found such a treasure, as I did today, and they give it away, and then all the world can see it, passed from hand to hand, cashier to cashier. But anyway, Day 1 of orientation was swell. Had to swag a 5 hr energy just so I could bring myself to a level where I could not yawn every 4 seconds, and pay attention. Because I have never had to pay attention at anything more serious, I think. So I learned new things....the next couple days should be fun, and then I start on the floor!! AH! So I've been thinking about this post for quite some time now. Quite some time. It all started a good 3-4 years ago when I was in the heavy midst of writing one of my novels, I was busy scrambling all the details, still in the heavy planning stages for it. Well, the novel flopped--never really made it with me. Maybe one day, but not anytime soon. I have bigger & better ideas to tackle first. But the ideas presented in the novel really stuck with me, apparently, considering I'm writing about one of them right now! The novel was a *very* futuristic novel. Like, in the next millennium type of novel. Or at least in a couple hundred years...a millennium is kind of a long time. Anyway, I had to re-conceptualize everything. The novel took so much time to plan because obviously, the human race then will have nothing in common with the human race today. Nothing. I can't even say we will have the same body organs in common because who knows what they will have, with adaptation and evolution and all that fun stuff. Also, who's to say we won't all be half robots that live til 500 by then, because we will probably find some sick, twisted way to re-grow our organs and just live forever? Heart failure? No problem- Just make a 30 minute doctor appointment, come out with a new heart. But thats not the point. The point is that I had to think about every single aspect of human life as we know it today, and re-wrap my mind around the idea and make it somehow, futuristic. Dating, the food industry, parenting, life, birth, death, school, healthcare, elderly, employment, money, etc. But one thing I had a unique plan for, was celebrities. Fame. The novel was supposed to take place underground. My (sort-of) premise was that by that point in time, the sun got too close to us/too hot for us and we had to all build these huge underground places. Multiple all around the world, but every country is responsible for designing their own. Mine just focus on how the United States handles them. So I knew fame wasn't a realistic possibility. Even though these underground units could hold 20,000 people (at least) per unit, that still wasn't enough people to let fame happen. I mean fame wouldn't mean anything. Celebrities, they would be seen all the time, because they would be sharing the same space with "regular people" all the time. So they would sort of lose their status. I mean think about it. If modern day New York City...if you took out ALL tourists (people that don't normally spend more than 3-4 days in the city a week), and just left the residents there, you'd have the size of one of these units. Well, quite a few celebrities live in NYC. After a couple months, years, the in town residents (keep in mind they would be the same people, no new incomers or outgoers) would frequently run into those celebrities, and it would become to not be such a big deal anymore. The reason why people go nuts over celebrities in NYC today, is mainly because of tourists. People travel to get to the city and are dying to see anyone remotely famous. The minute they see someone, its like a massive swarm (and sometimes dangerous) army of tourists & paparazzi (sp?). So thats why fame wouldn't work. So I had to re-think it, and I came up with the idea that celebrities wouldn't be real. No humans. All animations. Except there would be actual celebrity animations. It wouldn't be just a one time thing, like today an animated movie comes out and has its own new characters. No. There would be an animated "Judy McJudyson" (I just made that up lol) and she would have her own personality that was consistent in all her movies, but she would play different parts in all her movies. Get it? Sort of? Well, that was all good and well, but the idea didn't reoccur until I saw a preview for one of the new animation films coming out, and It came quickly on the screen, but It was an animated character and at first I thought it was a real boy (and my eyesight is not that bad, I promise). Its just scary how real they are making the animations look now....imagine what they will be doing in 100 + years? They can probably find ways to recreate celebrities from the past that have died or aged, and make realistic animations of them and have them be on screen again....that would be scary! I mean, think of the advantages....the film industry wouldn't have to pay celebrities anymore. A lot more films could be made. We wouldn't have to idolize celebrities, some that make us feel awful about ourselves. The economy wouldn't be as skewed, with some celebrities spending thousands on purses when others in the same city are spending $10 to feed their entire family. We wouldn't have to have stunt men. We could demonstrate crazy stunt effects and not put anyone in danger, and make it look real. But a disadvantage would also be the same fact that we wouldn't have celebrities to idolize. Someone REAL to look up too, to fantasize about....if they could do it, I could do it. They are human too.We wouldn't have that. Think about it. You may think its too unrealistic and will never happen, but think about it. Even just from Toy Story to Tangled, the animations are becoming scarishly real. And as demonstrated in "Enchanted", we can even put animations in real backgrounds. So, the possibilities are endless. Give it 100 years....we'll see what they come up with! So right after my last post, WHAT AD decides to come up on my blogger dashboard, but this? Guess I'll be checking out that website. But really, what are the chances? Just found out my brandy new nursing job will be starting on night shift. 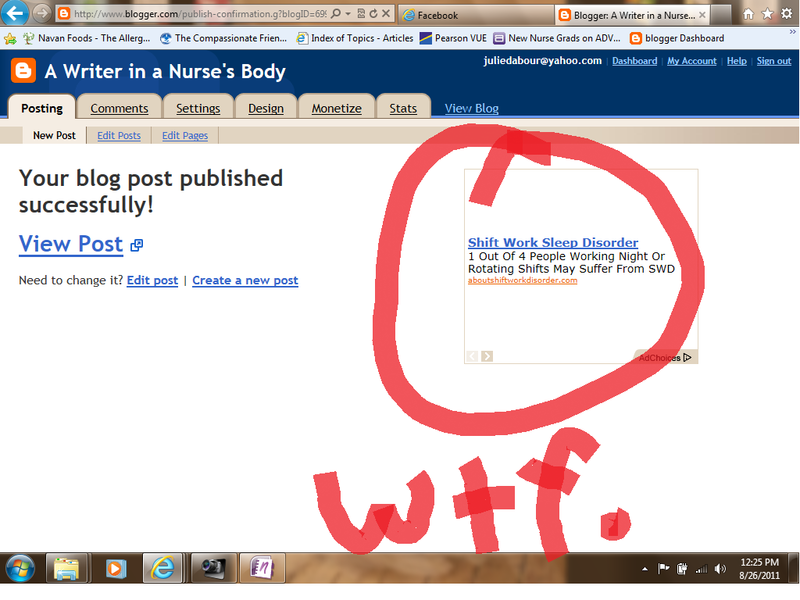 I know lots of nurses have to start nights and wait for days.....but...arrrghhhhhsoruewslfjk. Okay. So, like I said, somehow on this wonderful great Earth, I passed the NCLEX. Without taking any prep class. And I'm no smartie pants, trust me. So for all you future nursing students, or seniors, or post-graduates still waiting to take the test, let me give you a few tips. Because If I could pass it, anyone can. Disclaimer: It is highly very much so highly incredibly highly against the law to give out ANY information about ANY test questions or test material. So, I will take you from graduation day up until you sit down (literally) to take the test. From there on, well....you're on your own. The most important thing to do in step/phase one is to GO HAVE FUN! This is so important and I cannot stress it enough. You just graduated from a nursing program! You did it! You deserve to go do anything fun! Not just one day of fun. Go have a month long spree of fun, let your brain on overload have a BREAK, and just go do new things, meet new people, see new sights. TRAVEL! And most importantly during this month, don't open an NCLEX book. Chances are during this month post-graduation your ATT test number isn't ready anyway and therefore you don't even have a date set in stone anyway, so just have fun and relax. If you jump into nclex right after graduation, your brain is still on too much stress/overload. It just needs a breather. Also, right after graduation, your mind is probably so focused on what your last semester was information-wise. Take some time to let your brain adjust and re-gather everything you learned over the last four years, you're gonna need it. In this phase, I went to Europe. At first I was incredibly nervous about this because this delayed any studying by a month after graduation. Meanwhile my fellow classmates were already in NCLEX prep classes not even a week after graduation! I was nervous. I thought, oh man- they are so much already on their game....I'm not even taking any class. How can I possibly pass? But it turns out taking that month off was the best thing I ever could have done. This is a very very flexible phase. I will tell you what I did, but that is by no means the absolute best way. There are a LOT of great nclex-prep programs and study books out there, but I will tell you what to try and look for. After I got my test date set in stone, I knew I had exactly 6 weeks. So I bought the NCSBN's Nclex Prep Course for only $50 (VERY worth it!). This was a month long and requires 27 hours per week (on average) to finish it. I certainly did not put that time in, but it was still very worth the money. This program takes you through from the fundamentals of nursing, theory and anatomy up to the very end of nursing. It takes you through a very detailed but concise review of the most important facts you need to know, and then reviews with you with a post-test after each review. It even has a pre-diagnostic test so you can see where your weaknesses are from the very beginning. When you are done with the review sesssions (if you can make it through all of them), there is a couple full practice exams at the very end that you can just do on your own time. The BEST part is, is that the NCSBN (National Council of the State Boards of Nursing).....(I think)...they DESIGN THE TEST. Um, hello, $50 for a course designed by the people that design the real exam, compared to a $600 nclex prep course by (insert common nclex prep program here) that doesn't design the exam? Its kind of a no-brainer....right? This is not to say a real course is not for you. Some people need a $600 prep course where you sit in traffic a week after graduation in the hot summer and commute every day to sit in a review course and go over countless questions and then come back and do it again the next day. That is for some people. Some people don't have the attention span to do it over the computer. For less money. So, eventually that program expires. However, I also had in my back wing a $50 NCLEX prep BOOK ( this one ) to use after the first program expires. Now, I thought this book was great. It was just questions. But it first separates not only by body system but then separates again into particular diseases/syndromes/conditions so that you can review specific things you need help on. At the end of the book, is about 6 full (180 Q) practice exams that are jumbled in terms of question content. Just like the real nclex. Now, This is very important. In my opinion, you can't just have questions. Your brain can't fully learn that way. Your brain can't apply what it learns from getting one question wrong to a real question on the nclex. Thats a surefire way to spiral down quickly. If you don't take a review course, you need to find some way to review before/ during your questions. Now there are some books out there that review and then ask questions, but this is what I did... Our school used the ATI nursing exam-prep computer program throughout our entire 4 years at school. Now, thats all good and well because it got us used to nclex style testing very quickly, but the point is this: we got to keep our ATI review books, one book per nursing class. I could find no better way to review. So I let fate take its course and decide what I needed to review. I used a random number generator and let that decide what page to turn to on my question book, and if it brought me to "Hydatiform Mole" in the maternity section, I would go get my maternity book, review everything about hydatiform mole, and THEN take the 20 questions on it. Your brain needs to review on a topic and then get asked questions on it.....get it? So whether or not you choose to review with the NCSBN course, or ATI, or another random book, or your school notes-textbooks, whatever. Also, remember during review that nclex isn't about remembering every detail about every disease. Know the HUGE points. The obvious obvious points about a lot of things that can happen in nursing. From then on, its all about using that basic knowledge combined with knowing "How to answer a question even if you have no idea what they are talking about". So I did that random number generator type practice review, jumping around from topic to topic all day, and then did one comprehensive test at night.It is also really important during this stage to TAKE BREAKS. Trust me, I thought there was no way I would pass because I took too many breaks. I have done SO MANY fun things this summer and by no means did I sit at a table doing nclex every day (other than the week of the test). I would do one day of review for about 2 hours, and then wouldn't look at it again for another 3 days and then do another couple-hour review. You have to go at a comfortable pace and do what you feel right for you. A rule of thumb: the very minute you find yourself re-reading questions for the second, third or fourth time before you actually READ it, stop. Stop studying completely. If its night time, just go to bed or relax. If its in the middle of the day, go do something that doesnt require much brain power. This is your brain telling you, you need a break! Don't be afraid or guilty to take one! I prepped for what was going to happen the week of the test before the week came. I told friends and family that I would not be able to hang out very much that week, besides the must-do things like work. The week of, (in my opinion) it IS time to buckle down. You DO NEED BREAKS, but this is not a good time to schedule a vacation or take a three day trip to see your best friend. However, study like you've never studied before all day, (10-4) ish, and then relax by night. Watch a movie. Eat healthy. Just relax. Everyone has a different opinion on what to do the day before. I am a nervous worry freak person, and I did not feel ready yet so I kept reviewing, but I set limits. I told myself I would stop no matter what by 5 pm. And I stopped at 5:43 pm (lol), but it was still a nice stopping time. After that, I put it all away. I made a really good dinner, watched a favorite tv show, went out for Rita's with my family, wrote a blog, and took a bubble bath and thought about nothing. Other activities I suggest doing, depending on what you like to do: Listen to music that you LOVE, read a book, watch a movie, go for a run, go swimming, do anything that you love to do that has nothing to do with NURSING! Get away from all things nursing. Give your brain this one last chance to just relax, because you're gonna need all your brain power the next day! I want to tell you to go to bed early and get lots of sleep, but I know just as well as you that this is unlikely. I went to bed later than I should have and slept maybe all of about 30 minutes because I was nervous. So, not sure how to help you with that other than to say TRY to go to bed early, and get lots of sleep, but...you know. Its hard. I get it. I had my exam scheduled at 8 AM which I think was WONDERFUL. I woke up at 530, ate a lovely breakfast I made for myself, left house by 615, got there by 7 and was in the registration process by 730. Taking it so early, I didn't really have time to be nervous. I kind of felt cool and calm, because there is no point in making yourself a nervous bunch of nerves, because there is nothing more you can do at this point to prepare. The best you can do at this point is CALM DOWN, take a deep breath, and use all your brain power to take the exam. That is all. If you are taking it soon, know that I know exactly how you feel. I did NOT think I would pass, I had very little confidence. I was nervous that I never took that class, and only studied on my own. I didn't think I was smart enough to take it and pass. But I did. I stopped at 83 questions and that was that. Tip: when I hit 76, I did the universal freak-out moment. I did. I said I wouldn't freak out but I did. Because its nerve wracking. At 76 you know the computer is unsure about you and you could stop in 3 questions or in 150 questions, and you just have to keep answering. So after 76, I said a little prayer and just really, really, concentrated on each question and did the best I could possibly do- and what do you know- it shut off 8 questions later and I was done. I could have jumped for joy! So, for all my fellow nursing students out there, it will be OKAY. I promise. It truly is not as bad as everyone makes it out to be. Just REVIEW, PRACTICE A LOT OF QUESTIONS (this gets you used to knowing which answers are B.S.) and keep calm, and carry on! I PASSED!!!! I AMMMMM AAAA REGGGGIIIISSSSTTTEERRREEEEDDDDD NNNNNUUUURRRRRRSSSSEEEEE!!!! ahhhhhhhhhhh! Can I burn my nclex study books now? How is it that four years of college.....nearly $80,000....all means nothing until you pass a two hour (average) test? Failing simply cannot be an option. It just isn't. I've practiced practice questions to the point of nauseum. I have been making up questions in my sleep. I had a long, relaxing, encouraging conversation with a friend today that has already been through all this (successfully), and picked up a few tips and learned a little bit more about myself. I learned that I think I'm in the bargaining phase of....anxiety? I just made that up. Just watch, soon it will be in psychology textbooks. Next to the "5 phases of grief" there will be the "phases of anxiety". I do it all the time. When I need something to happen very much, I bargain. I plead, "please, if I can just pass this test, I will save the world. I will do a good deed. I will volunteer more. I will jump out of a plane. I will find a cure for cancer. I will....well, you get the idea. I just really want to pass this test. I promise, to all other nursing students that may read this, If i pass, then I promise to write a whole blog dedicated to study tips. It all comes down to this. Tomorrow. And then I find out Saturday (ish). I'm sure I won't have any fingers left. I've been practically chewing them off one by one. All my friends, all the people that know me, assure me I will do very well and be fine. But what if I don't? What if I don't? What then? What if they are all wrong? I mean, when my friends took it, I assured them they would do great, and I meant it, and they did do great....I just hope the same goes for me. Does it ever happen to you where you just can't seem to shake off a dream? No matter how much you think about it and say, OK, i think I can move on now- It just keeps lingering in your thoughts? I don't know. I have this recurring theme that comes in my dreams (not all the time, but often enough) and it hasn't happened in quite some time. Except this week its come back twice. Maybe my dreams are lingering because I am dreaming this week, period. I haven't been dreaming a lot at all (or at least, remembering them) and then this week I've had three strong ones already. But there is nothing you can do to shake it, except to just continue living life and eventually it will fade from your memory. I even sat down (literally, I sat down) prior to writing this entry and thought about the deep psychology meaning of this dream. Thinking that maybe if I could get down to its meaning, It would go away. No luck. Therefore, blog must be written. Lol. No but really, does this ever happen to you? Maybe not necessarily the dream sequence keeps returning, but the same feeling you had in the dream, keeps being reciprocated to real life, and you think, why do I keep feeling this emotion for no reason? Why do I feel like I have unfinished business? And then you realize its again, surprise, linked back to that dream(s). Don't get me wrong, I love to dream. If I could take a pill or something that let me dream every night and remember them all, I so would. I find dreams fascinating and very meaningful....but annoying, at times. They are annoying when you were so convinced that the dream world was real and then you wake up and realize it was all fake, and, welcome to the real real world. Ahh I'm going all Inceptiony on you! But anyway...taking the NCLEX thursday (ah!) so I probably won't be posting much until then. Or maybe I will, depends how much I am procrastinating. Like right now. I do want to post about another awesome photoshoot, but we'll see about that. So. Do you ever notice how at times, the rest of your entire future could be changed by one single thought? One little moment? 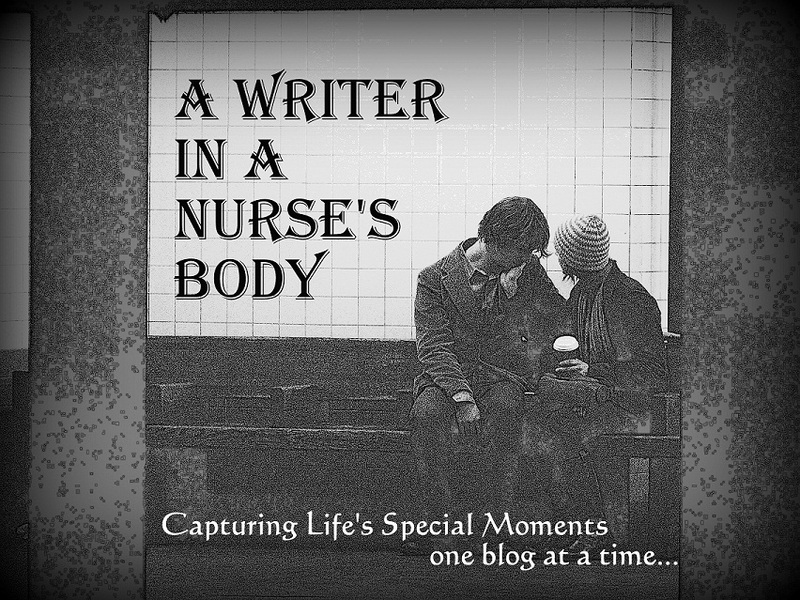 I've mentioned at times on this blog that I knew I wanted to be a nurse since my junior year in high school when my history teacher was absent and gave the substitute teacher a video about WWII to play for us. How does this relate to nursing? I don't know. It doesn't. But they happened to show a 5 second clip on nurses in the service taking care of babies and I realized that was what I wanted to do. I wanted to be one of those nurses. And so despite me changing my mind weekly in high school (child psychology>>PIxar>>architecture>>pixar>>artist/writer>>nurse) here I am today, still on the career path in nursing, my mind unchanged, about to take my NCLEX next week. Ah! But nursing....nursing has 1,000's of choices once you are an RN. Thats the advantage and disadvantage of nursing. Advantage because you can pretty much travel anywhere and mix yourself with any job and still be an RN. Beauty! Disadvantage? It's so overwhelming! So many choices! But I have had it narrowed to a couple of routes I would like to take. (Army, air force, maternity, trauma, travel nurse, etc). Paths I could see myself in. Well, another moment happened that will (probably) shape the rest of my life again. Until another moment intercedes again. First of all, I realized that although my personality and persona would LOVE to be in air force/army, I just don't think my health/body could handle the demands. Which is ashame. But Important, nonetheless. I need a little bit more of a stable job. Second of all (the big moment), I was in a patient room Saturday that had a clear view of our hospital's helicopter landing pad. Mind you, helicopters don't land with us often. My small hospital avoids trauma like the apocalypse. But for unavoidable traumas or complicated/worsening medical cases, sometimes helicopters must come in so we can send patients to other hospitals. Well, here I am watching the helicopter crew and I realized that I want nothing more than to be a MediVac nurse (on the helicopter). I have come across this thought many a times before but was never really sure if I wanted it. But standing at that window watching, I could almost feel this magnetic force pulling me there, I wanted to be there so bad. I want to the experienced, smart, efficient, life-saving nurse that is on that helicopter. I do I do I do I do want it so bad. So, thats that. Its going to be quite the life-plan. I'm starting out by dipping my toes in the water. This year, a little after I get "comfortable" (as comfortable as a first year nurse can get), I want to get my EMT and join a squad. This will serve two purposes- Confirm the fact that I like trauma and can handle it, and to also get me acquainted with the ER. After my first two year contract is up as a nurse, and if I like the ER scene, I want to look for a job in an Emergency room. Most MediVac Nurse positions require a multitude of ER experience. So I'll work here for quite a few years and then apply (when I feel ready) to be on the MediVacs. Cool, right? Right! So, cool. Studying for my nclex has been.....interesting. I have the attention span of a gnat and its been hard to review. But, the good news is, I skipped over this giant section of my computer program review, pretty much the gigantic section that covered every body system ever and Peds and ER) and I went right to the posttest and got a 55%. So I knew half the information without even reviewing. I'm ok with that. And I plan to keep reviewing and get that score up. Questions, questions, questions.....ahhhh. Well thats all for now. My scary movie project is going....well? Zombieland last night was actually really funny, even though it was supposed to be funny and not scary anyway. If i had known 3 of my favorite actors were in it, I would have watched it a lot sooner! I give it a 6/10. "You and I were friends from outerspace, afraid to let go. The only two who understood this place..."
Okay. I'm not even sure where to begin, to be honest. I lost a really great friend this past weekend. Saturday morning. I think I'm still in the Denial stage of grief. Its just so hard to......grasp. To really say to yourself, She is gone. I'm not going to see her anymore on random at work. I won't see her smiling face anymore, hear her laugh. I'm not in denial that she passed away. I get that. I understand that. I'm in denial I won't see her anymore, I guess. Its just so hard to believe. It happened fast. She became very sick very quickly and after all, we all knew death was imminent, as much as we all hoped she would pull through on the last minute and be fine. She was diagnosed with Cancer in June and we all imagined her pulling through the chemotherapy rounds and then eventually returning back to work one day. None of us knew, ever even thought, that it would end like it did. Maybe thats why its still so hard to believe. She was supposed to make it. She was hired where I work (at the hospital), on my floor, the same job as me, exactly a month after I. I met her when I was 18, five years ago. At the time I was only working alternating weekends, so I could toggle my other job and school as well. Therefore, she was my "weekend buddy", the only employee I really got to know at first. We were both still so new and we learned the ropes together, we had a lot of laughs and a lot of learning. Eventually I quit my other job and picked up a lot more shifts at the hospital and eventually met a lot more people and became very good friends with a lot more of my coworkers. But Ann was the first. She was way too young to die. Just over middle age, she was just starting to prepare for retirement and the major second half of her life. She was just recently dieting to be healthier...for some reason I can't get that out of my mind. Just a week or so before she was diagnosed I remember her asking for some time off to get some health check-ups done. She was fine, then. Or so we thought. Life is always full of "I should haves". If I had known that her being diagnosed with cancer and admitted to our hospital would end in her passing, I would have gone to visit more. I would have given her more hugs. I went to visit on occasion because I knew there would be more times to visit, a lifetimes worth. I was wrong. The earth shattering thought of it all comes down to this....she was "fine", and then two months later, she is not with us anymore. She was dieting, she was planning for the future, she was taking care of her daughter and mother, she was living her life, she was working full time, she was fine. It could happen to any of us. It could happen to any of us that we become sick, or any of us could die at any passing moment, and then what? Just like that? It's just hard to wrap your mind around. I think everyone naturally plans on and counts on the fact that they will live til their elder years and then its okay to pass away. I certainly do. I can't imagine myself not making it to the elder years, but then again, who actually plans on not doing so? Life just catches us so off guard its unbelievable. Upon her recent passing, all of us at work have been sharing our favorite memories of her. Memories she never would have imagined would be her last in our minds. Some of my favorite include this one time when staffing was an absolute mess one day at work and everyone was pulled to all different floors. I got pulled first to our psychiatric unit for a 1:1. Me and Ann were supposed to split the 8 hours and switch at 7pm. Well, 7 pm came and sure enough, she came down, but not to relieve me. She sat down right across from me, and told me she had been called down herself to watch another patient next door. So we spent the next four hours, right next to eachother (that never happens on 1:1's, ever), just talking, catching up and getting to know more about one another. Which got me thinking, if you or I died right now, what would peoples last memories be with you? Do you approve of those memories? What would you change? What would you wish you could have done before you died? For some reason, every time I come close to death myself (I make it sound like this happens a lot but its actually usually made up in my mind *hypochondriac*) I find myself thinking, "I can't die yet. I haven't written a book yet." A written book is the one thing I want this world to remember me by. So why aren't I writing it? I am fine, I am healthy, I am not dying anytime soon. I have all the time in the foreseeable, fortunate lucky world. So if it means that much to me to do before I die, why aren't I writing it? Why wait until its too late? I guess we always just leave those things to another day because "life" gets in the way. Our kids, our jobs, our responsibilities, our groceries, our errands. Our bucket lists can wait on another day, another time to start that, because today you have to run errands. Being in the healthcare field, I know how much she was suffering. She is no longer in pain now and had a very painful and traumatizing last month of her life, which no one should ever haver to go through. Being on the patient and nurse in my life so far, I know the dynamics and suffering of what she went through and I don't even know if I would be strong enough to do it myself. She was one of the strongest people I knew. So, knowing that, my only prayer is that Ann got to do what meant the most to her in life. Got to spend life with people she loved most and loved her most. I guess thats all anyone can ask for, when it comes down to the bare necessities, right? When words aren't warm enough to keep away the cold. It's not where our story ends"
. song lyrics by Train, "This Ain't Goodbye"
I hate scary movies. In fact, I make a point in life to specifically avoid all things scary. My version of "terrifying" is 'I am Legend' or 'The Sixth Sense' and anything past that, I have trouble even watching the trailer. After spending an entire childhood paranoid an ax-murderer is going to get me in my sleep and demons are chasing me up the stairs, and ghosts will be standing next to my bed when I wake up in the morning, and if I let down my hand off the bed a monster will eat it, and If i walk too close to a bed a hand will reach out and grab my foot, pull me under and eat me....you get the idea. I've finally gotten over all that (its about time) and i'm not about to retrogress back to that state of childhood paranoia. I remember having trouble sleeping as a very young child (under the age of 5 for sure) that someone was going to get into our house and my parents wouldn't be able to stop them and they were coming after me and there was no where I could hide. I mean, seriously, where does that even come from under the age of 5? I should have just started with intense psychotherapy at that point and moved on. Anyway, someone new in my life had the same childhood, terrified of all things scary. But then he learned to laugh at it, his mind learned to differentiate the movie world from reality, which I guess is what I have a hard time doing after scary movies after all movies. So now, naturally, he loves scary movies, like 99% of guys out there. So he is determined to break my fear and slowly work me up to the scary as sh** movies like, "the hills have eyes", "the exorcist"...or....dare I say it..."paranormal activity".........*curls up in a ball*. I have my limits though- I refuse to do horror, aka people hurting other people...aka the SAW series. I will not ever do people with dismembered body limbs. Ghosts, yes, I can do that eventually, demons, sure bring it on, little girls coming out of wells? Absolutely, lets do it- teenagers with their heads spinning around? Awesome! But chopping limbs off in any manner and tearing guts out for fun? Never, ever. So thats where I am officially drawing my line. ANYWAY, the point of this post....we are starting off small on this fear-breaking mission. Our first two are "SHutter Island" (which I actually have wanted to see) and "Zombieland" (this is more for a beginning comic relief than anything else). I have kind of always been very intrigued to see Shutter Island. I knew kind of what it was about (psychiatric patients, the worst of the worst) and boy oh boy- I do that every day at work, so I wanted to see that aspect of the movie. But did things jump out at you? Was there exceptionally scary moments? I didn't want to take that chance, so I never saw it on my own. Until yesterday. And it turns out....it wasn't scary at all! It was actually an amazing movie. It had a couple jumpy moments, but something is wrong with my reflexes lately....the jumpy moments happen and my brain reacts fast enough to tell my body there is no need to jump out of my skin like a lunatic. This comes in handy when my idiotic GPS consistently unexpectedly falls off my windshield in my lap when I'm going 70mph and I don't even flinch and inch. But the movie is one of those that really get you thinking....Leo Dicaprio must have a thing for doing those, lol. But especially with my experience working with psychiatric patients, the really made me think more so than the average movie-watcher. Since I don't think I can properly discuss what I'm about to discuss without spoiling the movie, DO NOT READ ANY FURTHER if you haven't seen the movie and DO plan to, one day! PLEASE DO NOT KEEP READING, because it will ruin the whole movie for you! Okay. So the movie ends and you're like.....what? I have to see the whole thing over again to fully grasp what the heck just happened in the last two hours. The whole first 3/4 of the movie, you (the audience) firmly believes that Leo is a cop, sent to this psychiatric island to help solve a missing patient-case. About half way through we learn that he has to get off this island immediately, before they find a way to claim him as psychiatric and keep him on the island forever, doing experiments on his brain like the rest of the crazies he meets. So the whole first 3/4 you are rooting for this character, you are worried about him and you want him to get off the island successfully before they "get him". Then the plot starts to unravel and you see how the island is starting to make him go crazy, he starts to hallucinate, have intense dreams, tremors, odd flashbacks, PTSD, etc. But the audience is still under the belief that he is a cop and this is unfortunately happening to him, the island is bad and the island is winning. Then you, the audience , start doubting who to believe at all. Leo gives such a remarkable stunning performance that leads you down the rabbit hole, and all the sudden you find yourself rooting for not only (now insane) Leo, but for all the psychiatric patients he meets, and you start really believing what they have to say, rather than the common sense coming from the island officials. You start becoming paranoid (like a psychiatric patient would) that all the things these employees are saying, no matter how helpful and genuine, is fake. Nothing is real, they are all there to hurt you. Leo brings you to the psychiatric world with such reality, you start to believe everything Leo believes. Eventually, they make him so crazy that eventually he believes it himself. You, the audience, start to wonder, wait- who do I believe? Did the island make him crazy or was he crazy all along? Suddenly you realize- he is the one thats been crazy all along and you have totally just been mindf*cked by Martin Scorsese. In fact, he is the most dangerous, delusional patient on the island and somehow everything you thought you believed is now not true and you have to go see the movie again. It is unbelievable. But it really got me thinking....there is this one scene in the movie that really, really made so much sense to me. For those of you that are still reading and have seen the movie, its the cave-scene where he is talking to Dr. Rachel. Rachel brings up the very valid point that....who deems someone crazy? If those island officials wanted to keep you on the island and make you seem completely insane, they totally could. Its easy to do. And once you are declared insane, no one ever trusts you or believes anything you have to say, ever again, no matter how valid. Employees that work with psychiatric patients don't believe you, they nod & smile because they don't want to believe you. Part of them doesn't want to be caught swept under down the rabbit hole. Who to trust, who is right, who do you believe? If something a psych patient says makes sense, you suddenly find yourself doubting your own sanity and you worry, which shouldn't happen, but it does. Its unfortunate- the lives that even the mildly insane live. Even if you spend a week in a psych unit for a minor breakdown, your reputation is forever tainted. Psychiatric patients all around the world are abused because who believes them if they come out and make allegations anyway? Everything is just blamed on the insanity. Its horrific. So thats my schpeel. All in all, it was one of the best movies I've ever seen. It hit especially home to me, as so much of it reminded me of my own job, and it really got me thinking not just about the movie but how I will forever see psych patients in a new way for the rest of my life. It will always be a constant struggle of not falling down the rabbit hole vs. trying to find some reality, reliability and validity in what your psychiatric patients tell you. If a psychiatric patient tells you someone hit them, do you believe them or do you blame it on the insanity, delusion, and manipulation? Who do you believe? PS- Naturally, the preview twists the movie to make it seem a LOT scarier than it is. Funny how trailers work like that. When you think about it, this video could just as easily be an ad for any antidepressant. But its not. Its falling in love. And they got it down perfectly. Hello everyone! So sorry I have been completely MIA! Things have been just absolutely a whirlwind of fun and insanity, mixed with no blogging time and also nothing to write about, all at the same time! I have been *so blessed* enough to have had the opportunity to go to Disney World (the land of Magical magical magical memories) in Florida this past weekend, starting Friday and to just yesterday. Disney is one of those places. When you travel far to get to Disney, you have that moment when you step into the parks and say, "Oh my goodness. I'm in Disney World. I'm in DISNEY WORLD!" and your happiness meter goes up a LOT. Its a similar feeling of disbelief that when you travel far to finally get to Europe, and you get off the airport in Europe for the first time and can't believe its actually happening. I guess for people that have to get on a plane to get to Disney world, its something totally out of this world. Disney is usually a very planned vacation, with hotels, and reservations, and planning, so much planning, and so much money, and planning. I mean some families reserve a year in advance and buy the disney books and start planning. Because you need to plan. Without an official experienced tour guide, you can't just walk into Disney and "do it right" the first time. So knowing all that.....to have just jumped on a plane, with the plane ticket bought 3 weeks in advance, to go to Disney for the weekend, was something so funly (new word) and magical and 20's and so impromptu, it was just so much fun! But, as you all know, I must have a reflecting session. I always reflect on my life's many experiences, small or large and think about what they mean to me, my past and future. Or just what it all means in general to the rest of the world. One thing I noticed that happened to be very funny and peculiar is that so many people have this amusing love for Tinker Bell! Its adorable. Like disney is magical, yes- And the shows they put on, incredible- but mid-show, when Tink shows up, the percentage of the audience that squeals, "It's Tink!!" Is very high. Don't get me wrong, Tink is adorable and loveable and so small but standing alongside all of the other characters, I think its interesting everyone squeals when she pops in for some fairy dust. Disney has showed me, or rather reminded me that the human race still believes in magic. And it makes me smile every time. Even though I have seen the shows and ridden all the rides multiple times prior, I like to go do it all again simply to see kids faces for the first time when they see it. I love hearing the "MOM! ITS MICKEY! MICKEY IS HERE!" and the "Daddy, did you see Captain Hook!?" I love their faces when they know they just met *the* real Princess Belle, or the real Peter Pan. They waited their whole life for that and to them, they just met a friggen celebrity. Their faces are priceless. Even the adults, too. I love nothing more than to hear the whole entire crowd, full of adults with kids on their shoulders, all synonymously sigh, "OOhh!" or "Ahhh!" When a magical moment happens in the epic famous "Wishes" or "Fantasmic" fireworks show is put on. It also makes me happy when one of the better ride stops and everybody, adults and all, all clap for such a great ride. They Clap! They had such a good time that everybody claps! How cool is that!? It gives you that human connection, that special bonding, knowing that what you just experienced for the last 90 seconds and loved, everyone else loved it just as much as you and you shared that experience with strangers and you smile together, and continue on with your life. It's kind of magical. There is something I have to say about video recording. I can't say much, because I am guilty of it myself and am not even sure why. I'm not even sure if its actually a problem or not, I have to think into the psychology of it all a bit first. When watching the parades and shows, I see millions of parents around me, all with their point and shoots and videorecorders, all videotaping the parades and shows. They aren't videotaping their kids faces when they see Mickey come out. They are taping Mickey come out. They are taping just the shows. Which makes me think....Why do we, as humans, do this? My only thought is that we are so swept away in that magical moment that we think- I have to record this to watch again, and again, to relive it another time. But do we ever watch it again? Will your kids ever actually watch it again, or...is it better and more magical to keep stored in your memory only? Our memory morphs experiences to make them seem even better than they actually were. Wouldn't it make sense then, to leave it to our natural memory to record the experience, rather than let our videorecorders do it, that we may never even watch again? Also, if you are videorecording, you are either having a pretty hard time watching the realhardcopy, ten years later. But what I say is, if you feel you or your kids has lost that magical memory, go back again! Save up for another trip! To conclude, I must share a funny moment with you. My friends and I went and did two of the drawing classes that are offered in Hollywood Studio's in the Disney Animation attraction. What the attraction is, is this studio classroom that holds about 30 people and an instructor with a projector of what he/she is drawing. They then guide you, based on what you can see on their screen, line by line (literally) on what to draw, step by step, to make a pretty good end product. And when we had this, a little bitty voice from the audience shouts, "ITS A TENNIS BALL!" And let me tell you, the cast member instructor couldn't help from stopping her drawing, and bending over to laugh hysterically, along with the entire class. Her only response was, "Yes, Yes it is a tennis ball." That went down into my top 50 funniest moments of my life. I couldn't tell you what any of the other funny moments are but If there were such a list, this would be in it. Well, that is all, folks. These next couple weeks....expect to not hear a whole bunch from me. I have three weeks (not even) to study for my *must not fail* test for my license...and time is running out rapidly. My days here on out will either be spent working, or studying. One more test to study for, All or Nothing. 4 years of college into this. fjljwlejfslfj.